Swipe... that's me dusting this blog off and preparing to write a post, long over-due! My humble apologies for leaving this blog without new content for the last ten days. I know I have some followers and friends who only see me here. I must remember that! I have all kinds of excuses on why I haven't posted. Would you like to read some of them? The polar vortex! Geez it has been cold, both yesterday and this morning. That accounts for a day and a half, though, which were/are obviously indoor days so no reason I couldn't be posting on my blog. But, snuggling up on the couch under an afghan watching '84 Charing Cross Road' seemed like a better idea. Home remodeling! Oh yes, well, not so much really. I do now have a video doorbell, self-installed before the polar vortex, which notifies me every time I go out to fill up the bird feeders. Ding! Video recording of me walking up my own front walk to get to the feeders. But really, if you are a scary person who decides to just randomly walk up to my front door and RING THE BELL, smile, please, you are now on camera! Other home remodeling. Well, yes, I have done some other home remodeling, if you count hanging up some new pictures as home remodeling, although I didn't actually hang them yet. I mostly just put them in the room leaning up against the wall where I will eventually hang them. And I did visit our local home show, but mostly to hear a friend's talk on gardening, not so much to find the next big idea for remodeling my home. I like my Formica countertops! They're green. Marie Kondo has me in her grips! Not really. I don't have Netflix, so I haven't watched her show and I've only read about her book, not actually read her book, but I've watched a few quick videos about how she folds clothes, which of course makes me an expert on her technique. I intend not to follow it, though, because absolutely every single clay pot that has ever been brought on to my property gives me great joy, even if it is chipped, broken, or otherwise unusable for an actual plant. Houseplants! Gosh, they can take up a lot of time in the winter time. Well, not really that much time but I did acquire some new houseplants from a dear old friend. I feel a Great Responsibility to take care of his plants, especially the African violet that he told me once belonged to his grandfather. I plan to take some leaf cuttings of it and root them to make more so eventually my dear old friend can take back the African violet or one of its offspring when the weather is more suitable for transporting houseplants. Reading! Yes, I've been reading. So far I've read 9-1/2 books since January 1st. The half book was a novel that had plants as a big part of the story. I wanted to like that book so much but I just couldn't like it. I had to abandon it half-way through. The plants were just a cover for a story that I didn't much care for. Plants shouldn't be used like that in books, to lure gardeners like me in like that. And then not deliver a good story. It's wrong. Remember, I started a podcast with Dee Nash of Red Dirt Ramblings. We've published 13 episodes. I think we are finally getting the hang of it! Would you please listen and let us know what you think by leaving a review on iTunes? Here's your link to the podcast - The Gardenangelists. We post new episodes late on Tuesdays. I am regularly—as in right now every day—posting little snippets on Instagram, where I am Indygardener. I'm mostly posting little typewritten letters to my garden with pictures of my garden each day. They also show up on my May Dreams Gardens page on Facebook. Oh, and how could I forget to tell you that I am working on the last little bits of proofreading and editing my third book of humorous and light-hearted essays on gardening, Seeded and Sodded: Living a Gardening Life, due out in late winter/early spring? This book will complete my trilogy of humor, also known as my trilogy of books to terrorize the non-gardener with knowledge of how gardeners think. And of course, I'm dreaming of spring! P.S. I begged the garden fairies to post but they said "No," and turned up the volume on whatever shows they are watching these days. They look like old gardening shows on YouTube! Maybe I'll get them to post this weekend. Some people want them to write a book, but they are so lazy, I'd have to do a lot of the work. We'll see. Wow, you have been busy! Winter is a good time for catching up (or not) on all the other things we don't have time for when the garden is going. 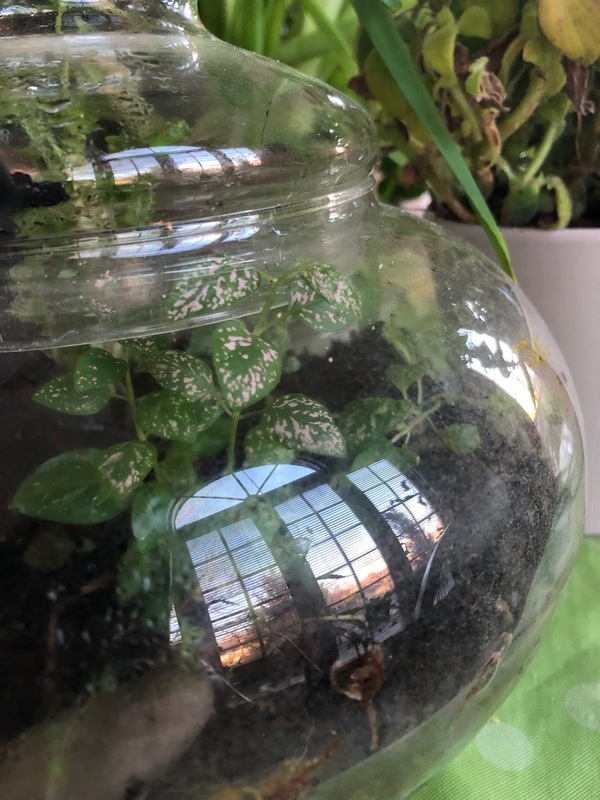 I have been enjoying your podcast with Dee, the fun notes to the garden from you and the garden fairies, and in addition my houseplants are getting a lot more attention! Keep warm!